References: Can Predictive Computation Reach the Level of Anticipatory Computing? Arsham H. 2002. Time series analysis and forecasting techniques. Available from: http://ubmail.ubalt.edu/~harsham/ stat-data/opre330.htm. Bennett CH. Undecidable dynamics. Nature 1990;346:606–7. Bennett CH. Universal computation and physical dynamics. Physica D: Nonlinear Phenom 1995;86(1–2):268–73. Bennett CH, Landauer R. The fundamental physical limits of computation. Sci Am 1985;253(July(1)):48–56. Chaitin G. What is life?. ACM SICACT News 1970;4(January):12–8. Dayan P, Kakade S, Montague PR. Learning and selective attention. Nat Neurosci 2000;3:1218–23. Delfabbro P. The stubborn logic of regular gamblers: obstacles and dilemmas in cognitive gambling research. J Gambl Stud 2004;20(April):1–21. Eberbach E, Goldin D, Wegner P. Turing’s ideas and models of computation. In: Teuscher C, editor. Alan Turing. Life and legacy of a great thinker. Berlin/Heidelberg: Springer Verlag; 2004. Ekman P. Emotions revealed. New York: Times Books; 2003. Ekman P, Rosenberg EL. editors. What the face reveals: basic and applied studies of spontaneous expression using the facial action coding system (FACS). New York: Oxford University Press; 1997. Elsasser WM. Theory of quantum-mechanical description. Proc Natl Acad Sci 1968;59(March):738–44. Fletcher PC, Anderson JM, Shanks DR, Honey R, Carpenter TA, Donovan T, et al. Responses of human frontal cortex to surprising events are predicted by formal associative learning theory. Nat Neurosci 2001;4:(October):1043–8. von Foerster H, Poerksen, B. Understanding systems: conversations on epistemology and ethics. New York: Kluwer; 2002. Gigerenzer G, Muir Gray JA. editors. Better doctors, better patients, better decisions: envisioning health care 2020. Cambridge, MA: MIT Press; 2011. Gladwell, M. The Naked Face. Can experts really read your thoughts?.The New Yorker 2002(August 5):38–49. von Glasersfeld E. Radical constructivism: a way of knowing and learning. London/Washington DC: The Falmer Press; 1995. Gödel K. Über formal unentscheidbare Säitze der Principa Mathematica und verwandte Systeme. Monatsheftfür Mathematik und Physik 1931;38:193–8. Gödel K. Some remarks on the undecidability results, In: Collected works II. Oxford: Oxford University Press 1972; :305–6. Heisenberg W. Über den anschaulichen Inhalt der quantentheoretischen Kinematik und Mechanik [On the clear content of quantum-theoretic kinematics and mechanics]. Zeitschrift fur Physik 1927;43(3–4):172–98. Hertwig R, Ortmann A. The cognitive illusion controversy: a methodological debate in disguise that matters to economists. Exp Bus Res 2005:113–30. Kahneman D, Tversky A. On the reality of cognitive illusions. Psychol Rev 1996;103(July(3)):582–91. Kane TR, Scher M. A dynamical explanation of the falling of the cat phenomenon. Int J Solids Struct 1969;5:663–70. Landauer R. The physical nature of information. Phys Lett A 1996;217:188–93. MacVittie K, Katz E. Biochemical flip-flop memory systems: essential additions to autonomous biocomputing and biosensing systems. Int J Gen Syst 2014;43(7–8):722–39. Mehta R. Mathematics of the Falling Cat. 2012. See: http://www.math.smith.edu/~rmehta/slides/fallingcatnew.pdf. Miller JB, Sanjurjo A. A cold shower for the hot hand fallacy. Working paper no. 518. Social Science Research Network 2014(June 15). Montgomery R. 1993. Gauge theory of the falling cat. In: Enos MJ, editor. Dynamics and control of mechanical systems. American Mathematical Society 1993:193–218. See also: http://dictionary.sensagent.com/ Falling%20cat%20problem/en-en/. Nadin M. Minds, computers, memory. Mind—anticipation and chaos (Milestones in Research and Discovery). Stuttgart/ Zurich: Belser Presse. 1991; pp. 128–39. See also: http://www.oikos.org/naminds3.htm#memory. Nadin M. The civilization of illiteracy. Dresden: Dresden University Press; 1997. Nadin M. Anticipatory computing. Ubiquity, article 4. New York: ACM; 2000 (December). 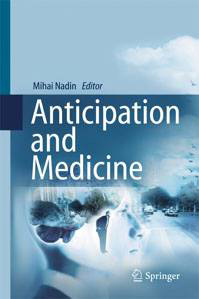 Nadin M. Anticipation in knowledge media design. In: Stefan P, editor. Knowledge media design. 2nd ed. Berlin: Oldenburg Verlag; 2006; pp. 71–90. See also: http://www.nadin.ws/wp-content/uploads/2007/06/mmn.pdf. Nadin M. Anticipatory computing: from a high-Level theory to hybrid computing implementations. Int J Appl Res Inf Technol Comput 2010;1(January–April(1)):1–27. Nadin M. Antecapere ergo sum. What price knowledge? In: AI & Society 25th anniversary volume: a Faustian exchange: what is to be human in the era of Ubiquitous Technology. London/Heidelberg/New York: Springer; 2013;28:39–50. Nadin M. G-complexity quantum computation and anticipatory processes Comput Commun Collab 2014;2(1):16– 34. Newton I. Philosophiae Naturalis Principia Mathematica (Mathematical principles of natural philosophy).1687. Nicolelis MA. Actions from thoughts. Nature 2001;409(6818):403–7. Nicolelis MAL, Lebedev MA. Principles of neural ensemble physiology underlying the operation of brain–machine interfaces. Nat Rev Neurosci 2009;10(July(7)):530–40. Pejovic V, Musolesi M. Anticipatory mobile computing: a survey of the state of the art and research challenges ACM computing surveys 2015; N(V),New York: Association for Computing Machinery (accepted for publication, January 2015). Sedlmeier P, Gigerenzer G. Do studies of statistical power have an effect of the power of studies?. Psychol Bull 1989;105(2):309–16. Stepney S. Local and global models of physics and computation. Int J Gen Syst 2014;43(7):673–81. Taleb NN. Learning to love volatility. Wall Street J 2012 (November 16). Turing AM. Intelligent machinery [technical report]. Teddington: National Physical Laboratory; 1948. cf. Copeland BJ editor. The essential Turing: seminal writings in computing, logic, philosophy, artificial intelligence, and artificial life plus the secrets of enigma. Oxford: Oxford University Press; 2004. Turing AM. Programmers’ handbook for Manchester electronic computer. Mark II. 1951. Tversky A, Gilovich T. The â€˜Hot Hand’: statistical reality or cognitive illusion?. Chance 2012;2(4):31–4. Watt DA. Programming language design concepts. Hoboken, NJ: Wiley; 2004. Wittgenstein L. Remarks on the philosophy of psychology. In: Vol. 1. Anscombe GE, von Wright MGH, editors, Anscombe GEM(Trans. ), Vol. 2, von Wright GH, Nyman H, editors, Luckhardt CG, Aue MAE(Trans. ).Oxford: Blackwell; 1980. Cited in J. Floyd: Wittgenstein’s diagonal argument: a variation on Cantor and Turing. Available from: http://www.bu.edu/philo/files/2012/09/Wittgensteins-Diagonal-Argument.pdf. Zadeh LA. Fuzzy sets as a basis for a theory of possibility. Fuzzy Sets and Systems 1, Amsterdam: Elsevier 1978; pp. 3–28. Zadeh LA. Foreword. Anticipation – the end is where we start from(M. Nadin). Baden: Lars Müller Verlag; 2003.